The author of the letter to the church at Ephesus is Jesus Christ (Revelation 2:1-3). This letter is a part of the Revelation which God gave to Jesus Christ, Jesus Christ gave to an Angel, and the Angel signified it to John, John wrote it down in a book and sent it to the churches (Revelation 1:1-2). A great blessing is pronounced upon those who read (aloud), hear and keep those things which are written in the last book of the Bible (Revelation 1:3). John received this wonderful disclosure while he was on the Isle of Patmos. He heard a great voice behind him as the voice of a trumpet, loud, distinct and clear. When he turned to see who was speaking, he saw seven Golden candlesticks; and in the midst of those Golden candlesticks he saw the glorified Christ, like unto the Son of Man, and he had in his right hand seven stars (Revelation 1:9-19). “The mystery of the seven stars which you saw in My right hand, and the seven golden lampstands: The seven stars are the angels of the seven churches, and the seven lampstands which you saw are the seven churches” (Revelation 1:20 NKJV). The seven Angels of the seven churches were the messengers of the churches and were in the hand of Christ, and therefore, should look to him for their support. Since Christ is the author of the letter, and since he walks in the midst of all the churches, he knows and sees all that is going on in the various congregations (John 2:24-25). God knows our thoughts and the intents of our hearts (Hebrews 4:13). David said, “Search me, O God, and know my heart: try me, and know my thoughts: and see if there be any wicked way in me, and lead me in the way everlasting” (Psalms 139:23-24). There were several things about the church at Ephesus which were right, and Jesus commended them for the right. Their works, labor and patience were approved by Christ (Revelation 2:2). Our work of faith, labor of love and patience of hope is neither forgotten by faithful men of God, nor by the Father himself (1 Thessalonians 1:3). Jesus also commended the Ephesian church for proving false teachers and not fellowshipping evil men. He said, “I know your works, your labor, your patience, and that you cannot bear those who are evil. And you have tested those who say they are apostles and are not, and have found them liars” (Revelation 2:2). We are commanded to bear with those who are weak, but we should never condone those who are evil (Galatians 6:2). There were men in the days of the apostles who claimed to be apostles of Christ, even as there are certain men today who say that they are apostles. The church at Ephesus tried them, weighed them in the balance and found them wanting, and therefore rejected them as imposters and liars. Those who said they were apostles were proved by the Ephesians to be imposters and therefore they would not bear with them, not even for an hour. The word “try” means to make trial of, test something for the purpose of ascertaining his quality, or what he thinks, or how he will behave himself; this, the Ephesians did to those coming into their midst who claimed to be apostles. DO NOT BELIEVE EVERY SPIRIT (TEACHER)! 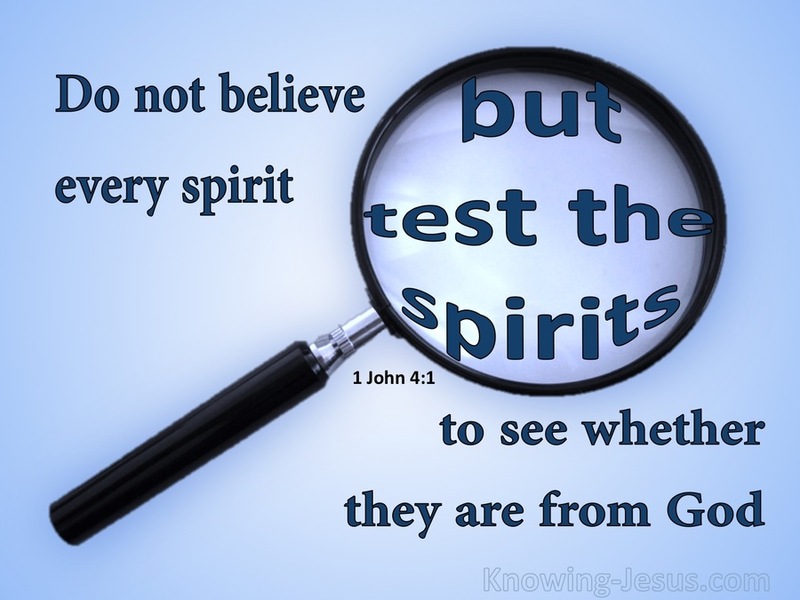 If we would be commended by Christ, we must not believe every spirit that comes our way, but we must test and try the spirits to see whether they are of God. Everyone who listens to and obeys the apostle’s doctrine is of God, and those who do not are not of God (1 John 4:1-6). Therefore, every child of God is obligated to prove and reprove the unfruitful works of darkness and have no fellowship with them (Ephesians 5:10-11). We are emphatically commanded to note any man who will not obey the word of Christ and have no company with him that he may be ashamed, yet counting him not as an enemy but admonishing him as a brother (2 Thessalonians 3:6, 14-15). But a factious man who draws away disciples after him is a heretic and should be rejected. “Reject a divisive man after the first and second admonition, knowing that such a person is warped and sinning, being self-condemned” (Titus 3:10-11 NKJV). Jesus also commended the Ephesian church regarding their attitude toward worldly deeds and doctrine. “But this you have, that you hate the deeds of the Nicolaitans, which I also hate” (Revelation 2:6). The Nicolaitans were the teachers of the new morality in the days of the apostles. They encouraged worldliness and sensual living. The church today must take a strong stand against all forms of worldliness (cf. Jude 4; Titus 2:11-14). To be pleasing to God we must not love what Christ hates, neither should we hate what Christ loves. Ahab was the wicked King of Israel. Jehoshaphat, the King of Judah, went up to see Ahab who persuaded him to join in battle with him at Ramoth-Gilead. Jehoshaphat helped a person who hated God, even though Micaiah a faithful prophet of God predicted that Ahab would fall at Ramoth-Gilead. Jehoshaphat listened to all of the false prophets which spoke lies, but Ahab fell just as the prophet had said. After the battle Jehoshaphat returned to his house in Jerusalem in peace, but Jehu went out to meet him and said, “Should you help the wicked and love those who hate the Lord? Therefore the wrath of the Lord is upon you” (2 Chronicles 19:2). No, we should not love that which the Lord hates; neither should we hate that which God loves. They could overcome this deficiency by remembering their former state from which they had fallen, repenting of their sins and doing the first works (Revelation 2:5). Copyright © 2017 Shelby G. Floyd, All Rights Reserved–Shelby G Floyd, wrote this article and it was published in The Informer July 29, 1973. This was the Newsletter of the Garfield Heights Church of Christ, 2842 Shelby Street, Indianapolis, Indiana.